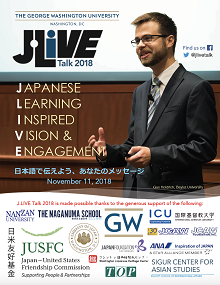 J.LIVE (Japanese Learning Inspired Vision and Engagement) Talk is a college-level Japanese language speech competition that emphasizes a comprehensive range of learned communication skills. connect with the larger Japanese-affiliated community. The competition consists of a preliminary round, the semifinal round, and the final round. During the preliminary round (September 1, 2018 - September 24, 2018) entrants send in a short video on a designated topic. Two different panels of judges will narrow down the field to 18 semifinalists and subsequently to 9 finalists. The final round consisting of 9 live presentations will be held at The George Washington University on Sundy, November 11, 2018. The top awards will include a chance to study abroad in Japan, as well as cash prizes. J.LIVE Talk 2018 is being made possible with the generous support from the following organizations. We welcome your support, too! Kakehashi Award added with the full sponsorship of the Japanese Ministry of Foreign Affairs and the Embassy of Japan, Washington DC!